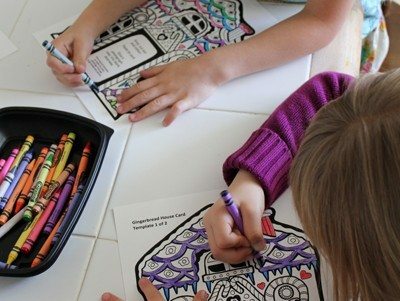 This craft is for kids that love to color-in and for parents that want a nice photo card for the mantle piece or for the grandparents this holiday. Best of all, it’s made using things you’ll likely have in your recycling bin. All you need are the two pages of printable templates, an empty cereal box and the plastic closure from the top of a packet of baby wipes. 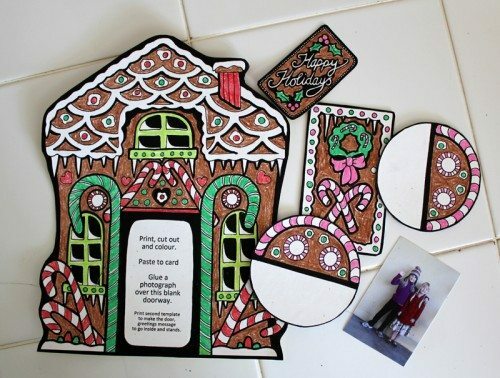 To assemble the card you will need some scissors, some hot glue, and a regular school glue stick. 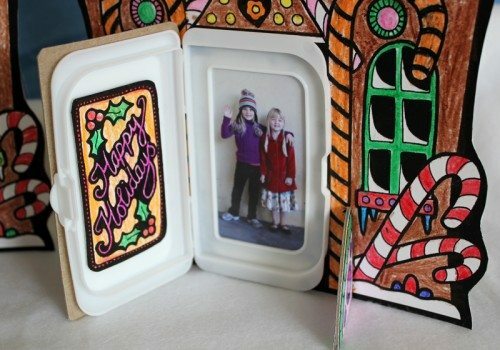 The finishing touch to this craft is a photo of your little artists to put inside the door. 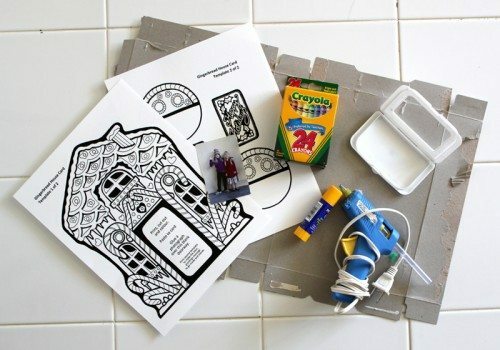 Kids can get stuck right in coloring their print outs any way they want. 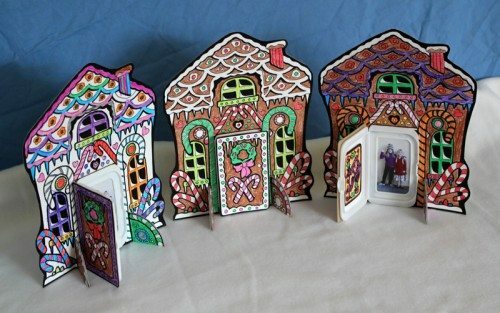 If your kids aren’t into coloring-in, or you want to take a more freestyle approach to this craft then just let them draw their own houses on a blank sheet, but make sure that the door area is going to be the right size for the plastic closure from the baby wipes packet to work. 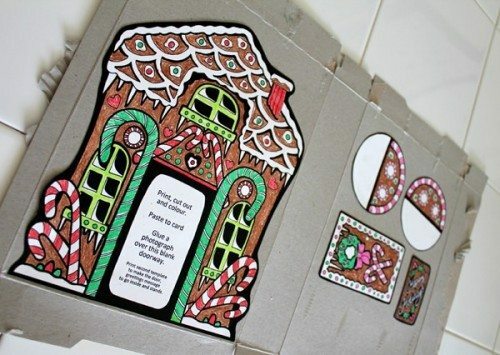 The kids can then cut out and use the glue stick to glue their house parts to the cardboard from your empty cereal box. You can use any cardboard you have handy, but it just so happens that a cereal box is the ideal size for this. If you have younger kids then you might have to cut the shapes out of the cardboard for them, but I’ve used a smooth black outline on the drawing to make the shape reasonably easy for older kids to cut out themselves. 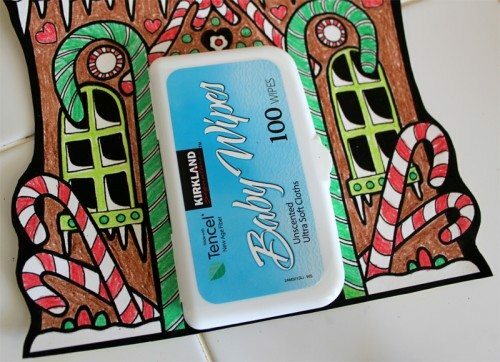 The next steps are going to work best using hot glue, because you’ll be gluing pieces onto the plastic closure you pulled from a baby wipes packet, although, if you don’t have a hot glue gun, double sided sticky tape would be a reasonable substitute. 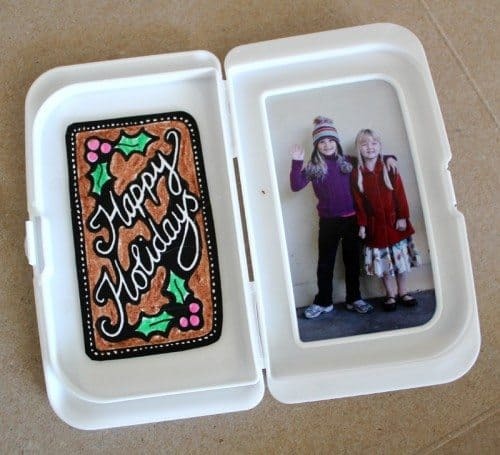 Glue your photograph to the back of the plastic closure, so that it can be seen through the little window when it’s opened. Also glue the greetings message to the inside of the closure, opposite your photograph. 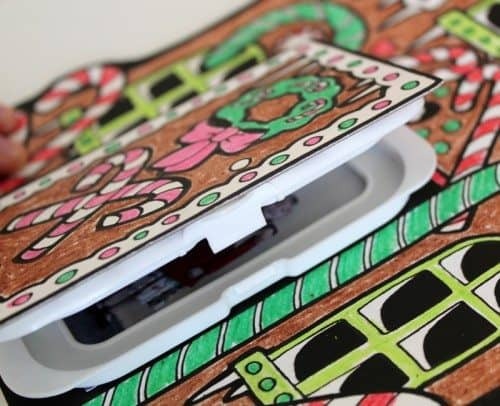 Close it up and hot glue it carefully (adults, this one’s for you) onto the blank door area on the front of your gingerbread house template. Then glue the image of the door onto the front of the plastic closure to complete the working door. 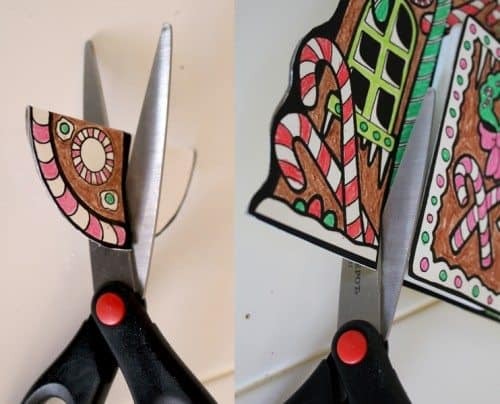 Finally, you will need to cut two slits on the outside edge of the big candy canes on either side of the gingerbread house door, about an inch in length, so that you can slot in the stands. Each stand is made by folding the circle stand templates in half, gluing them shut with a bit of hot glue and then cutting an inch long slit from the curved edge down to the middle as shown in the picture. 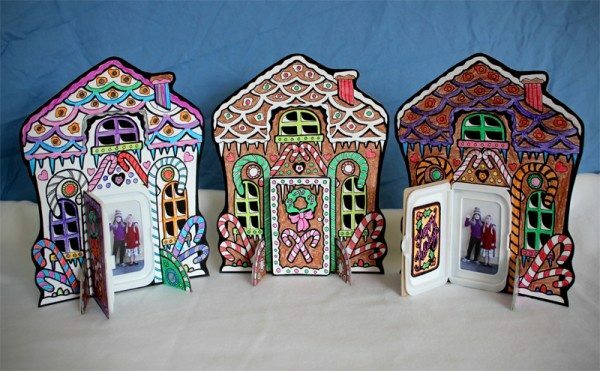 Once you’ve got your stands slotted into place, your little gingerbread house should stand up well and be able to be displayed with either it’s door closed, or open to reveal the waving holiday well wishers inside! If you can’t find a plastic wipes closure to use, or you just want a more basic card for the kids to color, I’ve also made a half-size template of this design for you to print out, cut, fold and color, which doesn’t involve any extra card or gluing. Click here for the card template. Adorable 😀 Thanks for sharing!